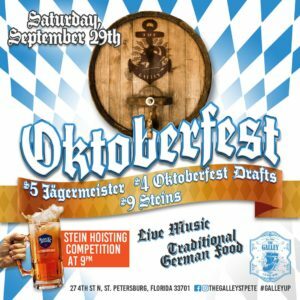 The Galley | Why Is Oktoberfest in September Anyway?! 10 Sep Why Is Oktoberfest in September Anyway?! Though it might still feel like the dog days of summer in Florida, a slight hint of morning crispness in the air let’s you know fall is right around the corner. And what’s one of the best things about fall (besides football, of course)? Oktoberfest! Of course, the name is a bit confusing. After all, Oktoberfest barely steps foot into its name sake’s month. But like all good traditions, a bit of history can easily explain this oddity. And we at The Galley are happy to share some knowledge about this annual landlubbers’ festival. Most beer-lovers are well aware that millions flock to Munich, Germany, each year to celebrate Oktoberfest. But few know the real story behind Oktoberfest’s beginnings. Back in the year 1810, fellow Bavarians all gathered to celebrate the royal marriage between Crown Prince Ludwig I and the Princess Therese von Sachsen-Hildburghausen. That’s not an easy name to say especially after a few brews! The festival began on October 12th and lasted five days while everyone enjoyed their fill of music, games, food, and of course, bier. The festival was such a success that those crazy Bavarians decided to have it every year thereafter. And thus, Oktoberfest was born. As time passed, however, the Bavarians had one issue with the festival. Like all good parties, they didn’t want the festival to be cut short. The reduced amount of daylight in October (no daylight savings plan yet) and the chilly nights cut the festivities short. Plus no one wanted to cover up those colorful dirndls and lederhosen! The solution was simple. They decided to move the two-and-a-half-week festival into the month of September. 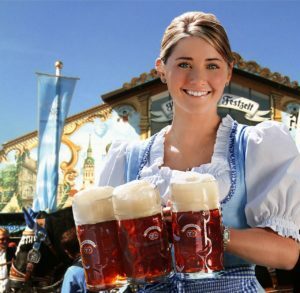 Though the first weekend in October is still included in Oktoberfest, most of the festival is now in September where the sunshine and the warmth are a bit more abundant. If you missed last year’s Oktoberfest extravaganza at The Galley, don’t let this year’s celebration pass you by. On Saturday, September 29th, 2018, The Galley will host its 2nd Annual Oktoberfest celebration from 11:30am until 3am the next day! Come dressed in your favorite Bavarian garb and dance to your heart’s content to Bavarian polka. Throughout the day, bier specials with $4 Oktoberfest drafts and $9 Steins will be flowing with plenty of pretzels to go around. If you’re feeling a bit more German in spirit, you might even prefer our $5 Jägermeister special that day! Of course, that’s not all. What would Oktoberfest be with the opportunity to hoist your Stein and “Prost” your fellow mates? At 9pm that evening, Sam Adams will be sponsoring a Stein-hoisting competition. Those wanting to join in the fun will hold a full Stein of water with their arms outstretched and their back straight. The person able to hoist their Stein the longest without spilling the water wins! Why water? Because it’s Oktoberfest, and we WILL cry over spilt bier! Bring your friends and join in the fun. 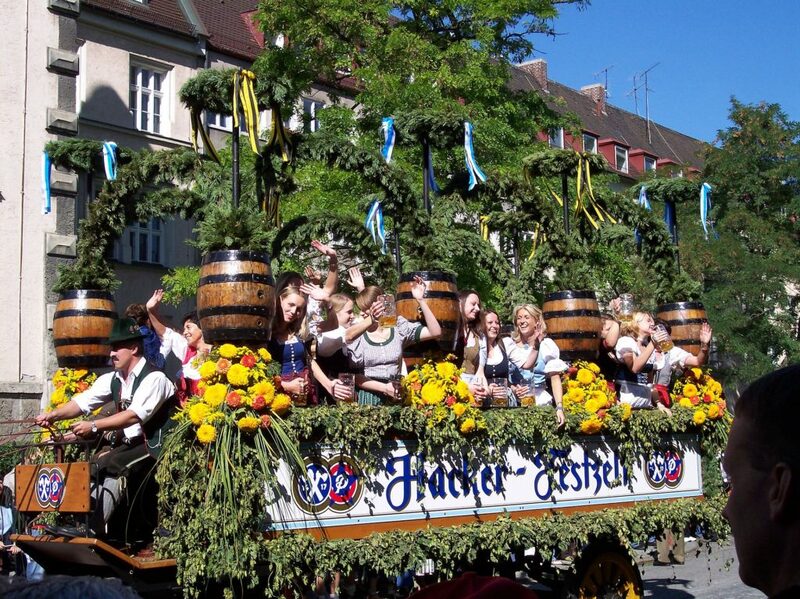 If you can’t attend Oktoberfest in Munich, then we will bring Oktoberfest to you! Enjoy All Your Other Favorites at The Galley Too! In addition to all the Oktoberfest activities and specials, you can indulge in all your other yummy favorites from The Galley’s new menu. Treat yourself to some Bacon CHZ Fries or our famous 7-grain grilled cheese. Or perhaps you might like to snack on our Galley Dog to get you in the Oktoberfest spirit. We now even have a snack and appetizer menu available until 3am for those late-night cravings. Whether it’s scrumptious seafood delights to delicious treats from (swah-rey), you can find just what you’re looking for at The Galley. The Galley is also the perfect place for watching football throughout the fall season. Every Sunday, you can find whatever NFL game you’re looking for while enjoying awesome drink and food specials. And before you know it, the Tampa Bay Lightning will be back in action. The Galley is your home for cheering the Bucs and the Lightning through another fun-filled season. And The Galley provides live music entertainment every Friday and Saturday nights. From Oktoberfest to great food and friends, The Galley wants to be your favorite neighborhood hangout. Let’s make fall 2018 one to remember!